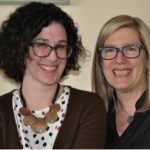 Kristi Allain (left) is Assistant Professor of Sociology at St. Thomas University, Fredericton. Her work examines gender, embodied aging, Canadian national identity, and sport. Barbara Marshall (right) is Professor of Sociology at Trent University, Peterborough. Her research explores the intersections of aging, embodiment, technology, gender and sexuality.